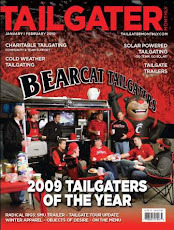 BearcatTailgater.com: The NeumannKy Uncovers Culprits Behind Last Nights "Technical Difficulties"!!! The NeumannKy Uncovers Culprits Behind Last Nights "Technical Difficulties"!!! The NeumannKy has spent all day investigating last night's "accident" and has uncovered the SHOCKING truth. This was no accident...it was an act of terrorism. At approximately 10:30 PM on 10-21-08, our beloved website was viciously hacked into by a trio of computer engineering students at none other than the University of Connecticut. Tails of the Ultimate Tailgate Trailer and the Bearcat Tailgate Crew's high level of awesomeness had reached all the way to Storrs, CT. Out of sheer hatred and jealousy, these Huskie loving super geeks got the brite idea to hack into the bearcattailgater mainframe and delete our website. Unfortunately for them, they did not realize that The NeumannKy is a Bearcat loving, beer guzzling, super genius who was able to trace the whole plot back to their virgin sanctuary on the Honors Engineering floor of the UCONN dorms. What wrath will these terrorizing scoundrels incur after such a trecherous deed? Let's just say I don't think these guys will be making the game on Saturday or any other home games for a long long time. How was I able to trace last night's act of terrorism back to these zit popping Huskie humpty dumpty's??? Well, the NeumannKy cannot reveal his methods and is pretty sure they are not interpreted as "legal" in most states....The NeumannKy has to give big props to Scotty O and Drew Mac for staying up all hours of the night last night rebuilding as much of the website as possible. They are tireless champions for our very special cause. We can promise, this will not happen ever again and BearcatTailgater is committed to providing the best game day experience for ALL Bearcats fans via bigger and better tailgates at ALL Bearcats home games as well as fun and exciting watch parties at Holy Grail for each and every away game!!! Join the Bearcat Tailgate Crew this Saturday at 11:30 as UC takes on UCONN and try out the new, official drink of the BTC, the "Bearcat Bomb"!!! Click here to RSVP for this Saturday's watch party and enter the event code "Bearcats". NeumannKy - I am glad you got the real story out! Down with the Huskies!